I was originally planning an update on Articles proposed for the 2019 Town Meeting. Then, I realized that there were still loose ends to report on from last year’s Annual and Special meetings. 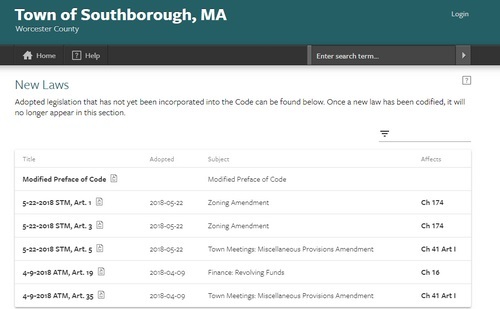 Recently, I noticed that bylaws in the Town’s online posting for the Town Code were outdated. The header confirmed that the text was as of changes adopted by 2017 Annual Town Meeting. I knew that changes adopted by voters in spring 2018 had been submitted to the Attorney General’s office for review. I reached out to the Town Clerk’s office to find out the status. Town Clerk Jim Hegarty responded that most of the bylaw changes were approved by the AG. He followed up on my questions by adding “notes” to the Town Code about those changes. You can find them summed up here. You can also find notations throughout the code to alert readers about uncodified changes to relevant sections. As for what wasn’t accepted, it was language specifying the quorum for the Zoning Board of Appeals. 174-25 (B)(A) Five members of the Board shall be present at every hearing. Four members may hold a hearing and act on the matter before the Board, provided that the interested parties assent thereto before the hearing opens. Any hearing may be adjourned for any reason by the Board, or by any member in case of the absence of a quorum, to a later date by a statement to that effect at the hearing, and the hearing as so adjourned from time to time may be held without any further notice, unless the Board shall vote that such notice shall be given. Assistant AG Kelli E. Gunagan’s arguments included that at least two aspects would prevent the ZBA from doing it’s job. One was issues caused by the lack of definition of “interested parties”. The other was conflict with state law on 40B permits, which cite a 3 person quorum. Because, by statute, a three-member majority of the ZBA’s five-member board is needed to grant a comprehensive permit under G.L. c. 40B, the by-law’s four-member quorum requirement may not be applied to votes of the ZBA on comprehensive permits under G.L. c. 40B. If the Town applied the four-member quorum requirement to an application for a comprehensive permit under G.L. c. 40B, the Town would be in violation of that statute. We suggest that the Town discuss these issues in more detail with Town Counsel. The news shouldn’t come as a complete shock to voters. We were advised by Special Counsel on Town Meeting floor that the language was legally questionable. A clear over 2/3 of the hall chose to allow the Attorney General’s office to make that call. The Board will hold public hearings on all applications submitted to it. A quorum shall consist of four members or their alternates. No member shall appear or represent any person in any matter pending before the Board. No member shall hear or decide an appeal in which he or she is directly or indirectly interested in a personal or financial sense. Still, prior to the AG’s announcement, the proponent and some readers expressed anger over interference by the Town’s attorneys to influence the AG’s decision against voter approved language. Hoolahan said that she followed up with a statement from her lawyer. She was then further upset to learn that both Town Counsel and Special Counsel followed up with rebuttals, arguing against allowing the bylaw approved by Town Meeting voters. I should have put notes in the appropriate online code section as soon as the AG decisions for that section were made. I’ll do that in the future. In going through the Town Code, I also noticed that it doesn’t include the Salary Administration Plan (SAP) instead referring people to the Town Clerk’s office for a copy. (After all, it is an 18 page document.) However, you can find the most recently approved version online via the Personnel Board’s page. Click here for that. *Hegarty was referring to decisions received from the AG on 9/19, 11/9, 11/15 and 12/21. Updated (3/4/19 12:28 pm): Last night, Hoolahan pointed out in a comment that the subsequent paragraph in the code that the AG did accept refers to a four member quorum. I updated the post above to include that. So although the specifics of HOW they act was removed by the AG, the number describing what volume of representation constitutes a quorum was maintained and that number is 4. The victory was their decision to maintain a quorum of 4- which was what I and my fellow residents wanted to do. Maintain a number for ALL meetings to hold debate. Remember this is QUORUM question (how many people need to be present to listen and hear discussions) NOT a VOTING question (How many people to be vote for approval) and a Conflict of Interest question which certain members of our BOS, Town Counsel and our Town Administrator attempted to conflate with the actions that were in complete contrast to the requests and votes of the citizens in May at Special Town Meeting. Thank you again for sharing the updates! Thank you for pointing that out. I updated the post. Your headline is incorrect, false, and needs to be corrected. The Attorney General’s Office APPROVED ARTICLE 1, virtually in its entirety. (The only language not accepted was under “A,” which was the Town’s own rusty mistaken language.) Importantly, the AGO did approve the quorum requirement language. Importantly, why is Town Counsel and Special Town Counsel arguing for a quorum of three versus four? NOT OK. And why are they thwarting the will of the people? Who authorized them? This is public Town business, where is the vote and discussion? And Town Counsel is self-proclaimed to have a “conflict of interest,” which still exists and he is not excused from. In my humble opinion, they should both be fired, including the Town Administrator who has acted on this matter and has no legal authority to do so. Where is the email chain authorizing him? He certainly hasn’t handed it over? Beth, not sure where you are getting this “interpretation” from but you need to look into the real information correctly and report on that. A bigger board is harder to stack and corrupt — that ‘s the POINT: that is why Article 1 was voted in overwhelmingly by the citizens. Less is NOT better. You need to look into why certain persons are fighting this and are who exactly authorized those legal opinions? I did correct it already prior to your comment. As for “interpretation”, I think it is clear that I got it from the AG’s letter of explanation that I quoted and linked.